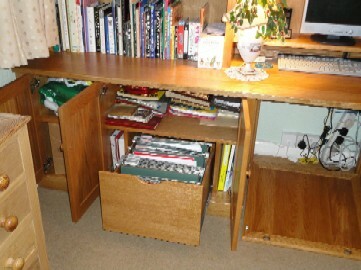 Clients from Herstmonceux, East Sussex required plenty of storage for books, computer, paperwork and craft supplies. Their room lent itself to a full wall of units, as R and M had a very good idea of how they wanted it to look the design was arrived at fairly easily. The approximate overall size is 2.5m high (8′ 4″) X 3m wide (10′). The choice of finish is Light Oak. Home Study in Light Oak. The doors are constructed from European oak, the frames mortice and tenon jointed with central fielded panel and hung on Blum style hinges The lower section incorporates the knee hole desk in the centre with filing drawer inside the left hand pair of doors and shelf over. The cupboard to the right houses the computer and printer. The big concern was the excess heat and access for wiring, this was overcome with a removeable fielded panel with a discrete air gap at the top to the rear of the kneehole. The end cupboards on both sides are storage with adjustable shelves. The book cases above have solid oak shelves, fully adjustable and suspended on magic wires. The furniture is fully fitted around the skirting boards and scribed to walls and ceiling. 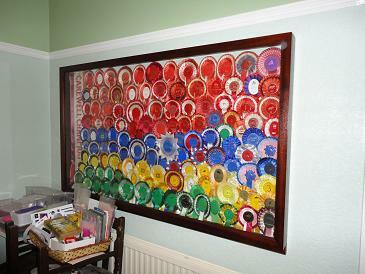 The other piece made was a display case for rosettes approx. 900mm high (35″) X 1500mm (5′) wide in Sapele with toughened glass front. 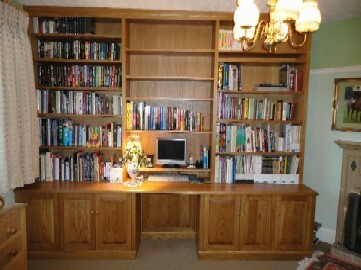 One Response to Fitted Oak Bookcase with Cupboards Incorporating a Kneehole Desk. Dear Nick,thank you for all your kind help and assistance with our lovely bookcase. We are delighted ” over the moon “. We will be in touch when it comes to the bedroom.